But which beauty, old or new, is able to save the world? Are the Russian writer and the early Christian church father referring here to what we usually call art? Or do they mean to point with the word ‘beauty’ to a higher level? Does this human longing for beauty have anything to do with what we read in Genesis regarding creation? Surprisingly enough the opening chapter of the first book of the Bible has as a refrain: ‘And God saw that it was good.’ The Hebrew word that is used there can be translated as ‘good’ and as ‘beautiful’. The whole chapter takes on a different colour when we hear God say that the light, the sun, flowers, plants and animals all are ‘beautiful’, and the first humans ‘very beautiful’. Beauty was here from the very beginning. There are things that cannot be caught in definitions. Some things simply are beyond the capacity of words. This is the case with beauty as well as with art, the human striving for beauty captured in material form. We can’t deny it: in every man and every woman lives a deep seated longing for this beauty that is found and tasted in thousands of places. Also the early Christians were aware of this. In the fourth century Basil stated: ‘By nature man longs for beauty.’ The hunger for beauty is inside all of us. This hunger can be misleading. Some try to satisfy it with eroticism, with possessions or pleasure. But can these really save the world? It is clear that Dostoevsky and Augustine refer to a beauty that includes physical forms, but also extends to beauty of a spiritual nature – a beauty that takes possession of our consciousness and influences the way we live our lives as human beings. Both men, after all, knew the trinity of the old universal values of goodness, truth and beauty. But even more than by these three philosophical notions they were impressed by a person. The Person in whom they saw goodness, truth and beauty embodied and incarnated: Jesus Christ! When iconographers have finished their training, they must pass a test to prove mastery. Traditionally that has been to paint the theme of the Transfiguration, Metamorphosis in Greek, the transformation of Christ on Mount Tabor. Jesus’ disciples Peter, John and James are eye witnesses of his transfiguration (Matthew 17:1-13; Mark 9:2-13; Luke 9:28-36). This transformed Christ, this metamorphosis in all its beauty, thus stands at the beginning of the career of each consecrated iconographer. From now on brushes, gold leaf and pigments are used in the service of God, who in Christ gave form to his Beauty, Truth and Goodness, making them visible as well as touchable. 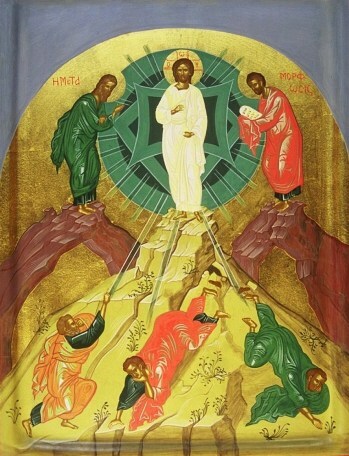 The icon of the Transfiguration from the hand of Jan Verdonk, an iconographer living in Amsterdam, shows us Christ in all his Beauty as the Alpha and Omega of Truth and Goodness. According to the traditional icon, Augustine and Dostoevsky it is Christ’s beauty that leads the world to the path of metamorphosis and salvation. Drs. Alfred C. Bronswijk is a theologian and writer. He has worked as a pastor, broadcaster and teacher. He has written poetry, songs, contemporary prayers and various books. Recently he has published a book about icons.